The LANCOM Wireless ePaper Premium Mount 7.4” gives you greater freedom in the design of your digital room signage. It has a larger mounting surface, which makes it easy to attach the display even to smooth surfaces. Its gray coating is color-matched to the LANCOM Wireless ePaper Displays, so providing a uniform and discreet appearance from any angle. Modern environments make special demands. Which is why you can mount your 7.4” LANCOM Wireless ePaper Displays with the Wireless ePaper Premium Mount very quickly and easily. Using the mount to install the displays requires no additional tools thanks to the supplied adhesive dots. These provide an ideal hold even on surfaces where mounting with screws is not possible. You have the option of mounting your digital room signage on glass or metal elements. A high standard of design and comfort is a must in modern workplaces and conference rooms. The use of glass design elements is on the increase, which can make the installation of digital signage more difficult. 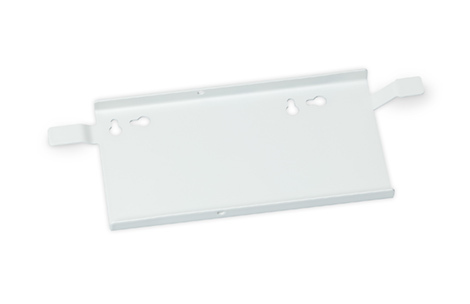 The display mount and the enclosed adhesive dots ensure that the LANCOM Wireless ePaper Displays 7.4” are securely mounted with a minimum of effort. The coordinated design means that the LANCOM Wireless ePaper Displays and the display mount blend in seamlessly from any angle. In the healthcare sector, professionalism and quality are paramount—and these values should also be reflected in the premises. With the use of the LANCOM Premium Mount, LANCOM Wireless ePaper Displays can even be attached to glass elements where window film is used as a privacy screen.